Many see China as a rival superpower to the United States and imagine the country’s rise to be a threat to U.S. leadership in Asia and beyond. Thomas J. Christensen argues against this zero-sum vision. Instead, he describes a new paradigm in which the real challenge lies in dissuading China from regional aggression while encouraging the country to contribute to the global order. 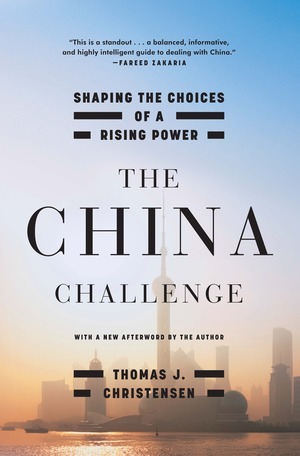 Drawing on decades of scholarship and experience as a senior diplomat, Christensen offers a compelling new assessment of U.S.-China relations that is essential reading for anyone interested in the future of the globalized world. The China Challenge shows why China is nowhere near powerful enough to be considered a global “peer competitor” of the United States, but it is already strong enough to destabilize East Asia and to influence economic and political affairs worldwide. Despite China’s impressive achievements, the Chinese Communist Party faces enormous challenges. 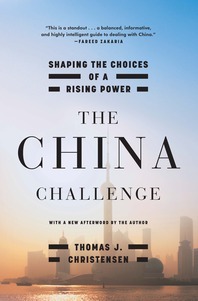 Christensen shows how nationalism and the threat of domestic instability influence the party’s decisions on issues like maritime sovereignty disputes, global financial management, control of the Internet, climate change, and policies toward Taiwan and Hong Kong. China benefits enormously from the current global order and has no intention of overthrowing it; but that is not enough. China’s active cooperation is essential to global governance. Never before has a developing country like China been asked to contribute so much to ensure international stability. If China obstructs international efforts to confront nuclear proliferation, civil conflicts, financial instability, and climate change, those efforts will falter, but even if China merely declines to support such efforts, the problems will grow vastly more complicated. Analyzing U.S.-China policy since the end of the Cold War, Christensen articulates a balanced strategic approach that explains why we should aim not to block China’s rise but rather to help shape its choices so as to deter regional aggression and encourage China’s active participation in international initiatives that benefit both nations.